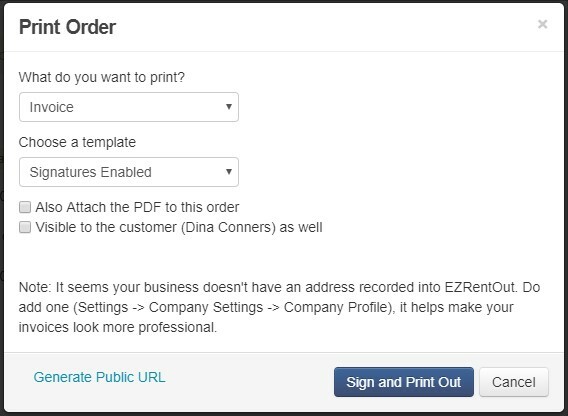 Printouts generated in EZRentOut can now be electronically signed. These printouts include Rental Agreements, Invoices, Quotations, Packing Lists, and Receipts. 3. 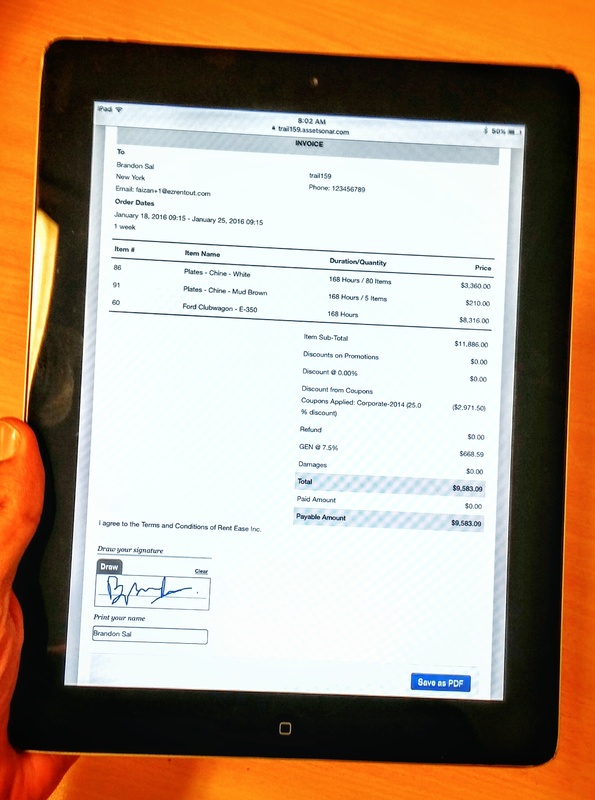 Capture electronic signatures – e-signs in action! From More → Printout Templates –> Orders, edit the printout templates you need to get signatures on. You can also create new ones if you like. Let’s say you’re editing/adding an invoice template in Order Printouts. Go to Details After Line Items and click the +Add option. The elements list will pop up. 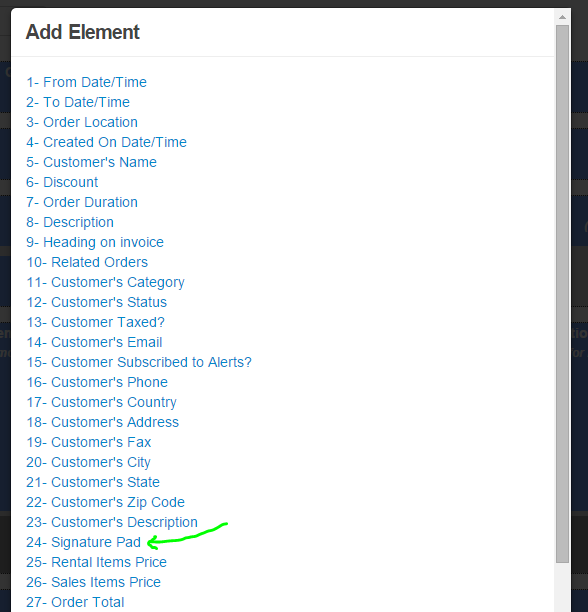 Choose Signature Pad from the options listed. By clicking the three dots right under +Add, you can choose to have a single column design, which looks better. You can use the Free Text element to add any Rental Agreement/Terms and Conditions in the Details After Line Items section. 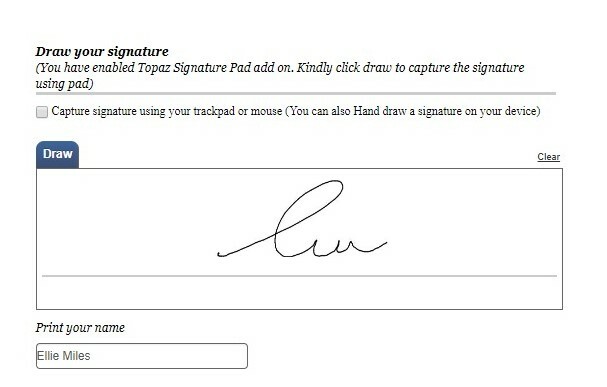 EZRentOut now offers support for the Topaz Signature Pad for capturing electronic signatures. 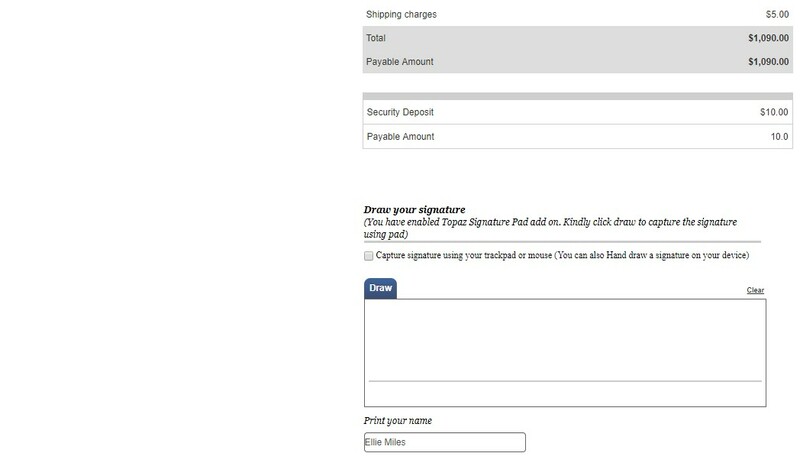 This will enable more convenient signature capture to make the verification process smoother for your users. Plus or above EZRentOut Package. Now, let’s set up the Add On. You will need to install the respective support files for the hardware integration to work. Add Chome Extension: Add the Topaz SigPlusExtLite Chrome Extension from the Chrome Webstore. Click on “Add to Chrome”. Download Executable File: Download the SigPlusExt application to your device. Install application: Once the installation file has downloaded, run the .exe file to start the installation. When prompted, set “T-S” as the Tablet Model Group, “T-S460” as the Tablet Model, and “HSB (USB type)” as the Connection Type. Connect the pad: Once the installation completes, connect your Topaz pad to your laptop USB port. Enable Topaz Add On: From your EZRentOut, enable the Topaz Add On by going to Settings → Add Ons → Enable Topaz Signature Pad Integration. That’s it! You’re ready to use your Topaz Signature Pad. 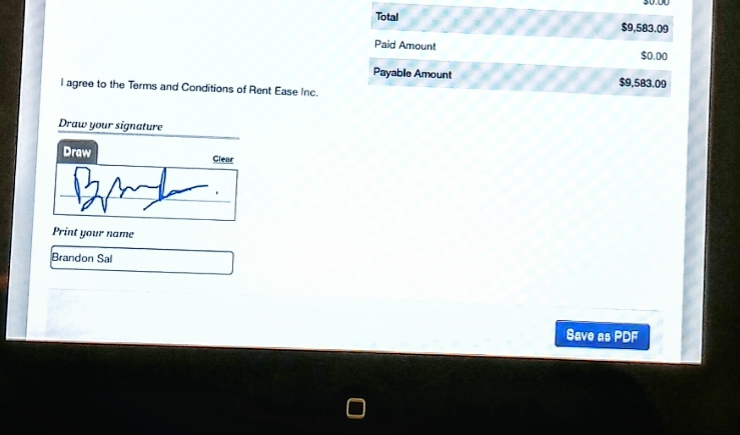 It will now be able to capture signatures for all invoices, orders and rental agreements. Customer Ellie Miles walks in for a rental order. You pull up her order (say it’s Order # 10) on your PC/Mac/iPad, and hit the Print Order button. On the Print Order pop up, you can choose the invoice (or any other printout) that includes the signature pad. You can also choose to have it attached with the order, and visible to Ellie when she signs into her EZRentOut Portal. Click the Sign and Print Out button. The invoice will open in a new tab. Ellie can use the mouse, trackpad, or the Topaz Signature Pad (provided it is configured) to draw her signatures in this area. She can also type her name or other details in the Print Name area. If you’re using the iPad, she can just sign using a stylus or her finger. 7. You can then tap Save as PDF button to get the PDF Invoice and email it to Ellie or collect a printout. You can keep working with EZRentOut on the PC/Mac while keeping the iPad for the customers to use. When a customer walks in, make their order or charge payments from your PC/Mac. To get signatures; pick up the iPad, type in ? followed by the order number in the search bar (using EZRentOut in Safari and not the mobile app). For example, if it’s Order #10, you’ll type in ?10. This will directly take you to Order #10. Now hit Print Order, choose a printout type/template, and check the ‘Save with this order’ option. The printout (invoice, agreement etc.) will open. Give the iPad to the customer to sign. Finally hit the ‘Save PDF’ button to save the printout. Read More: How to get customers to sign Order Printouts themselves? Have feedback about our equipment rental software? EZRentOut is the equipment rental software used by SMBs all over the globe. Sign up today for a free 15-day trial. For more assistance, drop us an email at support@ezrentout.com. You can also share your ideas on our Community Forum or visit our knowledge base and blog for detailed support posts. This entry was posted in [Support], Feature, productivity and tagged e-signatures, invoices, rental agreements by admin. Bookmark the permalink.